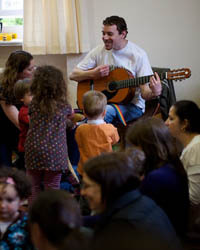 Acoustic guitar-led musical fun/singing/dancing/marching to nursery rhymes and songs from the musicals.....but with lots of oomph! parent or carer with shakers, bells, bubbles and ribbons. No need to book, come whenever it suits and pay at the session you attend. Any enquiries call Eddie 07736 637975, email info@eenymeenymusic.co.uk or pm me on Facebook. Eeny Meeny Music (established 2007) is a mix of nursery rhymes, traditional songs and popular tunes from Musicals. Played live on acoustic guitar, with plenty of rhythm, in a relaxed atmosphere. I don’t use an amp or sing through a mic/speaker as I find toddlers react really positively to the organic sound of a natural voice and instrument. 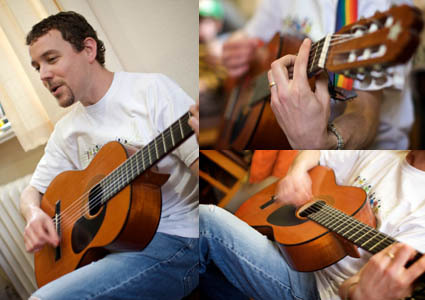 The session is for children and adults alike and ideally I aim for an all-inclusive singalong, which feels like a brilliant ‘event’ when in full flow! But equally feel free to relax and just listen and soak up the music and watch the bubbles drift by! I don’t segregate by age; the little ones learn from the bigger ones, the bigger ones learn from the grown ups - so everyone in the room taking part is gently encouraged. Before long the children will learn the songs and sing them to you all week long. And they might just get stuck in your head too!